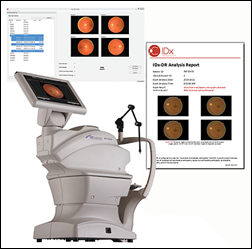 IDx receives FDA clearance to market its AI-based diabetic retinopathy diagnostic system to PCPs, giving them access to a tool that assesses patients without need for physician analysis. The company received its clearance via the FDA’s Breakthrough Devices program. Eric Topol noted in a tweet that only four AI medical algorithms – all of them related to pattern recognition – have earned FDA’s approval. Two are for imaging, one for is ECGs, and now IDx’s for retinal changes. From Rif’d Me a New One: “Re: Hitachi Vantara. RIF’d a number of us, with rumors of 800 to 14,000 globally. What amazes me is how they’ve been able to keep this out of the news. I’ve also found it interesting how certain executives have been getting promotions and pay increases, which might be better spent keeping a few more workers.” A Hitachi Ventara spokesperson responded to my inquiry with this statement: “As we continue to transform to help our customers unlock the value in their data, we must shift certain resources to best support our business. Hitachi Vantara is, in fact, growing significantly. In the past year we have hired more than 1,300 new employees to support high-growth segments of our business, with over 230 current job openings.” The digital tools company that focuses on IoT– a subsidiary of Tokyo-based Hitachi — was formed in September 2017 by combining Hitachi Data Systems, Hitachi Insight Group, and Pentaho. From History Repeated: “Re: Epic and Meditech. 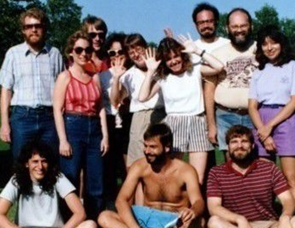 As they approach their 40th and 50th anniversaries, respectively, it would be neat to see an article about how Judy Faulkner and Neil Pappalardo met. Ideally as a joint interview, but individual recollections would be fine. The stories I’ve heard are that Judy came to Neil seeking advice about starting a company. What did they think of each other then? Now? Epic uses MUMPS, which Neil invented – was that part of the conversation?” Those two folks are #1 and #2 on my most-wanted interview list, but both also decline every time I ask. It would be fun to capture their memories and, as always, I’m here to do so if they are willing. 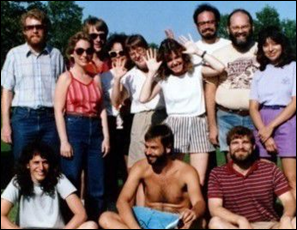 Above are early company photos of both from the sunny slopes of long ago. This week’s question of “What I Wish I’d Known Before … Selecting a Consulting Firm for EHR Implementation or Optimization” is still open. Listening: new from Denver-based Nathaniel Rateliff & the Night Sweats, big-sounding soul music recorded in Rodeo, NM. There’s also new music from a band I really like but forgot about, The Magic Numbers, whose new single more ballad-y hard rock than before. Their 2005 debut remains one of the best I’ve heard. To address my frequent need to hear the soaring virtuosity of progressive rock, I moved on to Kaipa, a Swedish band that’s been around since 1973 and that spawned the musical career of Roine Stolt, later of The Flower Kings, Transatlantic, and now The Sea Within (whose first album is due in June). None scheduled soon. Previous webinars are on our YouTube channel. Contact Lorre for information. Glen Tullman’s Livongo Health raises $105 million in a Series E funding round, increasing its total to $248 million. The company announces that it will work with Cambia Health Solutions to develop and market new consumer-friendly digital health offerings for people with chronic conditions. Peterson Regional Medical Center (TX) selects CloudWave’s OpSus Backup, Archive, and Recover services. Eleven-bed critical access hospital Munising Memorial Hospital (MI) chooses Cerner CommunityWorks. Russ Johannesson (Sharecare) joins diabetes management platform vendor Glooko as CEO. Former CEO Rick Altinger will transition to EVP of corporate development. Martin Tursky (Firelands Regional Medical Center), who spent a couple of years as VP/CIO at Aultman Health Foundation (OH), is named president and CEO of McLaren Central Michigan (MI). MedData develops OneTouch RCM software to bring patient financial services onto a single platform. PatientPing expands the availability of its real-time clinical and administrative data sharing technology for ED patients beyond Massachusetts to hospitals across the country. CVS Health unveils a set of tools to help pharmacists, physicians, and patients make more cost-conscious decisions about prescription drugs. 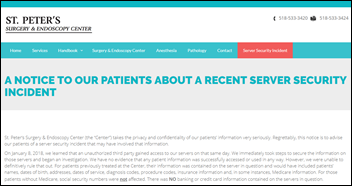 St. Peter’s Surgery & Endoscopy Center (NY) notifies 135,000 patients of a January data breach in which its servers were hacked. Philips warn that security vulnerabilities in its ISite and IntelliSpace PACS products could affect patient confidentiality and system integrity, some of which could expose systems to remote attacks using publicly available exploits. 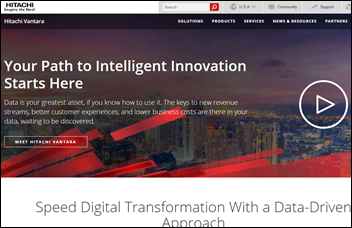 The company recommends enrolling in its ongoing patch program, which remediates all critical vulnerabilities, or upgrading to newer versions of IntelliSpace and Windows. At an AMIA briefing on Capitol Hill, Geisinger Health System (PA) Chief Clinical Informatics Officer Alistair Erskine, MD points out that Apple’s Health Record app initiative is more limited than headlines suggest, given that it excludes Android users and does not yet give users access to their full medical records. 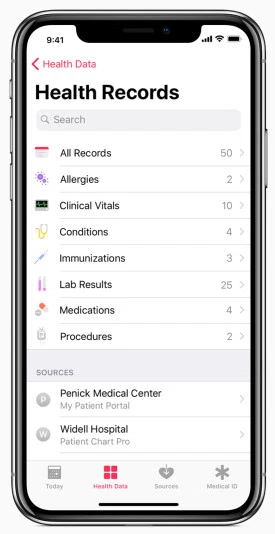 Geisinger was one of the original 12 beta testers of the app; 39 health systems have signed up to partner with Apple so far. This article, highlighting the experiences of early adopters Penn Medicine (PA) and Johns Hopkins Medicine (MD), also presses pause on the Health Record app hype machine, pointing out that providers at non-participating organizations must proactively ask patients to share their data and are then faced with the question of what to do with it in its raw form. A Black Book survey of health technology managers finds that hospitals that have implemented an enterprise master patient index have fewer duplicate patient records, reducing their cost, denied claims, and the number of repeated tests and procedures. QuadraMed’s product is #1 in user satisfaction and loyalty. HIE technology provider Koble Group will integrate patient risk management software from HBI Solutions. Lightbeam Health Solutions will exhibit at CAPG April 19-21 in San Diego. LiveProcess will exhibit at the Preparedness Summit April 17-20 in Atlanta. MedData will exhibit at the HFMA Florida Space Coast Educational Event April 18 in Titusville. Clinical Computer Systems, developer of the Obix Perinatal Data System, will exhibit at the AL HIMSS 2018 Spring Conference April 18 in Huntsville. Experian Health will exhibit at HFMA AR April 18-20 in Hot Springs, AR. Daw Systems adds electronic prior authorization technology from CoverMyMeds to e-prescribing functionality within its ScriptSure EHR. 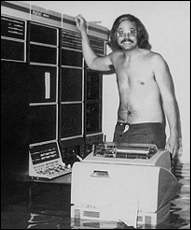 I think Vince covered some of the Judy/Neil P story in his HIS history, and Epic moved away from Mumps/Meese decades ago, went to Intersystems cache and other tools Cache was also loosely based on Mumps but bears little or no resemblance to it today. Many people don’t realize that M(umps), being the original NoSQL platform, is very well suited for the type of data processing that’s needed in healthcare. I am also a Nathaniel Rateliff & The Night Sweats fan. Totally agree on the new record. One of your other recommendations from earlier in the year also has a new record out. Sarah Shook and the Disarmers released last week. A little more twang on this one but still worth the listen. Looking forward to the Nate Rateliff & the Night Sweats show this summer. Caught them last year at a festival and now a huge fan. The new record is fantastic. The new ones by Buffalo Tom and Superchunk are pretty swell too. Good year for new tunes from older acts so far. I guess if my favorite bands are still putting out good stuff it means I’m still not that old yet. Dr. Topol is way off in terms of the number of medical AI approved. The number is closer to 40 than 4. Nobody ever seems to question anything he says, despite the fact that he is usually misinformed.